Growing plants can be a profitable business for everyone from a small backyard operation to a giant nursery. Anyone with a little know-how and a suitable place to grow can produce salable plants of various types that can provide a little extra income or a full-time salary. But all plant growers do not reap the same benefits, often because of the types of plants they choose to grow. Some plants simply make more money than others because of the initial investment and the markup they enjoy. 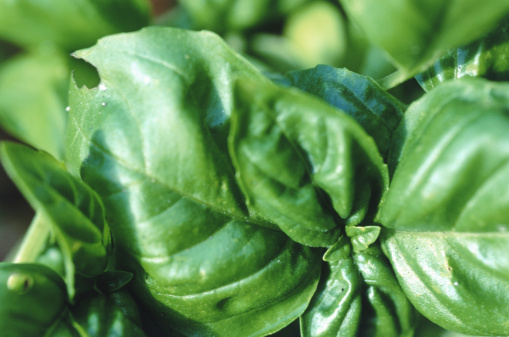 Fresh basil is an easy to grow and profitable perennial herb. Ground covers are a smart choice for gardeners looking to make a profit on their backyard nursery. A plot of just 50 by 50 feet can produce 8,000 plants, as four of these small plants will fit into a single square foot of ground, according to the Profitable Plants website. Most ground cover plants can be sold for between $3 and $5 and are inexpensive to start. You may even be able to increase your profits by using free growing stock after the first season. According to the Profitable Plants website, ground cover plants can average a $20 per square foot profit. Among the popular ground cover plants are ivy and chamomile. If growing larger plants is your desire, there is considerable money to be made that way, too. Growing spruce trees, cottonwoods, Japanese maples, junipers or azaleas is a sure way to boost profits at a nursery. Although they may take longer to grow than smaller plants, landscaping trees and shrubs will bring considerable money on the wholesale or retail markets, and they often provide the means to grow many trees from one starter. According to the Profitable Plants website, one tree farmer plants 10,000 trees on a single acre and has grown and sold thousands of cottonwoods produced from one original tree. Some of the most desirable ornamental trees, such as the Japanese maple, can sell for up to $150 per plant, and you may be able to reproduce the trees with no additional investment. Perennial herbs are a smart choice for profitable gardening. These small plants require minimum space to grow and are started without much expense. They will also return year after year, providing growers with more samples to sell. Perennial herbs like lavender, basil, oregano, mint, sage and even garlic can be grown in small containers and require only minimal gardening skills to grow successfully. If you check the price of fresh herbs at the grocery store, you'll see that the going retail price is quite a markup from what you'll need to begin some plants.